Who doesn’t like a story about penguins? Such cute little birds all dressed up in ‘suits’ waddling around the place. All children will love the hilarious antics and the bizarre trouble the penguins in Mr. Popper’s Penguins get up too. 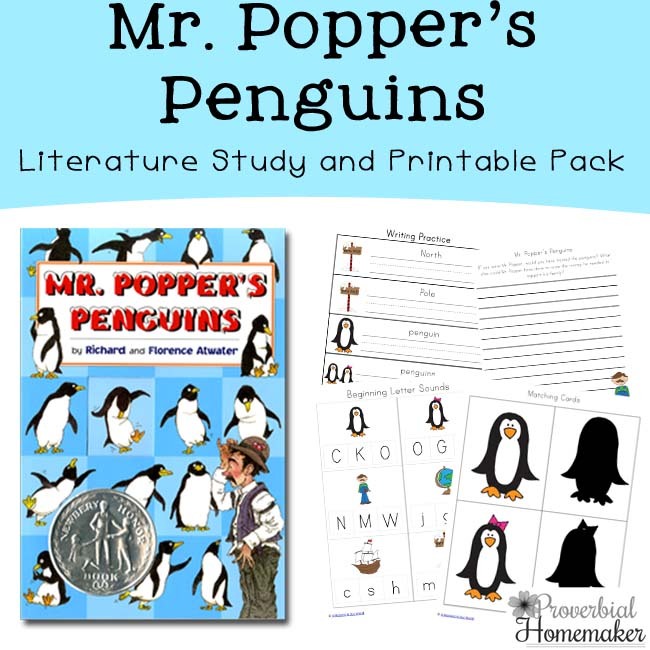 Mr. Popper’s Penguins is a fabulous book that offers many great opportunities for learning in a variety of subject areas for your early to middle elementary aged child. A Moment In Our World has a great Mr. Popper’s Penguins Literature Study. Progeny Press also has a great Penguin Literature Study. These Penguin Notebooking Pages are when researching penguins. This Penguin Study contains over 60 pages with information on all 17 species of penguins. For those that love lapbooks, this Penguin Lapbook is also a great way to learn about penguins. One night there was a blizzard, which covered the Popper’s living room in snow. Research blizzards and find out how they happen. Use this Antarctica Lapbook to learn more about the environment in which penguins live. These Antarctica Notebooking Pages are great for researching this very cold continent. Use a blank map of the USA to draw a path of penguin feet from one city to the next, following the journey Popper’s Performing Penguins took. Research Admiral Drake and his expeditions. Make a timeline of the events that happened in the story. Have fun with these Penguin Colour-By-Letter Pages. See how many words you can make from the word: Penguin. 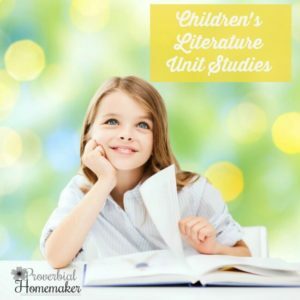 Choose your favourite passages from the book and use them for copywork. This book uses a lot of alliteration. Research this type of poetry and make up your own. Make some cute cotton ball penguins. Make some cute Penguin Bookmarks. Enjoy this Penguin Sensory Bottle. The penguins hid in the opera singer’s skirt. Research opera singing and find out how they learn to sing the way they do. Put on a penguin show. These Penguin Colour-by-Number Pages are so much fun. The chapter numbers are written in Roman Numerals. This Roman Numeral Puzzle is a great way to introduce and learn Roman Numerals. Find out the distance between the cities that the Popper’s visited and how many miles they travelled during their ten week trip. Responsibility – Talk to your children about owning a pet and being responsible for looking after that pet correctly. Honesty – Talk about being honest and doing the right thing at all times. Just like Mr. Popper was trying to be honest and do they right thing by getting a licence for his penguin. Greed / Selfishness – Mr. Popper could have made lots of money from the penguins if he wanted to, but he thought of the penguins first and not himself. Talk about how his decision to take the penguins to the North Pole was a good one. He did not show greed or selfishness. Make some yummy Sledding Penguin Frozen Banana Snacks. At the start of the story, Mr. Popper had finished work for a few months, which means the Popper’s budget will be tight. Work out a meal plan and grocery list to help with the budget. 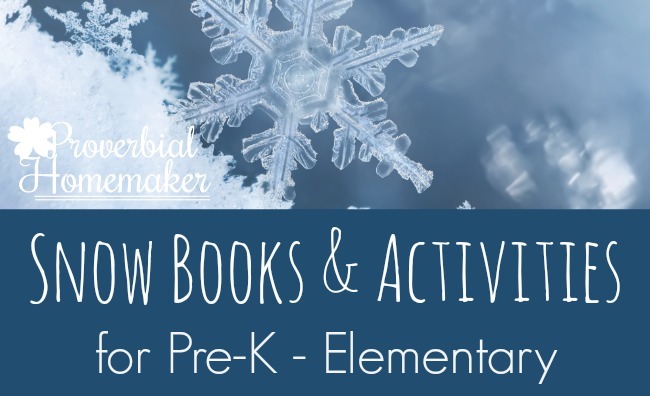 To enhance your reading and learning, download this free 50+ page printable pack that contains activities for ages 2 – 12. 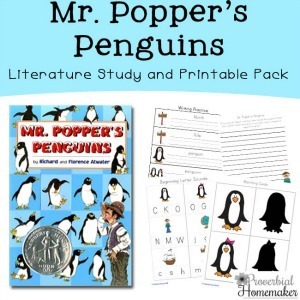 Download the Mr. Popper’s Penguins Printable Pack! Such fun ideas! My boys will love this! What a beautiful download. We love Mr. Poppers penguins. Such a fun story.